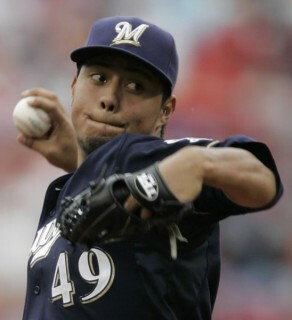 Gallardo is a key to the Brewers ascending the standings in 2013. He is 69-43 (.616) Career so Far with a 3.63 ERA. He just falls short of being labelled a top 10 pitcher. How about the Starting pitchers: Gallardo, Fiers, Estrada and ? ? Probably not what you would like to see as a Brewer fan, but the reality is the 2013 Milwaukee Brewers have two spots to fill in their starting rotation. There are possible internal options with Tyler Thornburg, Wily Peralta, and Mark Rogers – but this group of players are young and can’t be counted on to compete throughout an entire season. The club inked Tom Gorzelanny to add depth to the Starting Rotation/Bullpen help. When you look at Mike Fiers numbers from last year (9-10 record, 3.74 ERA, 1.261 WHIP), you realize he has the potential to be a serviceable MLB starting pitcher but he will remain a solid #4 or #5 in the starting rotation. Fiers had an ERA of just 2.31 after 8 starts – however his next 15 games, the ERA was doubled He still finished with a respectable 3.74 – to accompany a 9 – 10 Won – Loss Record. Marco Estrada fared well in 2013 despite his 5 – 7 Record. The man Struckout 143 batters in 138.1 IP and held down a respectable 3.64 ERA. The man from Mexico took the loss for his hometown country versus Canada last night. The Brewers will need for him to take the next step in 2013. His WHIP was outstanding last year at 1.142. Chris Narveson will try to earn a spot back in the rotation after spending most of the 2012 season with a torn rotator cuff on his throwing arm. He is 26 – 18, with a 4.67 ERA in 93 career games with Milwaukee so far. He can always head to the Bullpen if he doesn’t make it as a starter. Along with Axford, the Brewers signed Mike Gonzalez (434 GP, 2.94 ERA and 56 Saves) and traded for Burke Badenhop (3.03 ERA in 66 Appearances during 2012) for added depth to the relief core. The team also features Jim Henderson (36 Appearances, 3,53 ERA and 45 SO in 30.2 IP), The team will need to make up for 282 Vacated Appearances by Kameron Loe (SEA), K-ROD (FA), Jose Veras (HOU) and Manny Parra (CIN). Tom Gorzelanny has a career record of 44 – 45 and a 4.41 ERA with 3 different clubs in his 8 year career. He is a swing man that could see time in the rotation – or like he did last year with the Nationals out of the Bullpen. He was 4 – 2, with a 2.88 ERA in 45 Appearances last campaign. As mentioned above, the club has Gorzelanny listed as the #2 man out of the Relief Pitchers Thornburg may be the odd man out and be sent back to the Minors. A bevy of Minor League Pitchers like Josh Stinson, Johnny Hellweg, Ariel Pena and Miguel De Los Santos may all have a chance to see some time with the big league club in 2013. Brandon Kintzler may also be an option as he continues to battle back from a 2010 injury to his pitching shoulder. Pitching aside, the 2012 Milwaukee Brewers offense was one of the best in baseball. The Brewers ranked 1st in Home Runs, Slugging Percentage, Stolen Bases, and Runs in the National League last year. 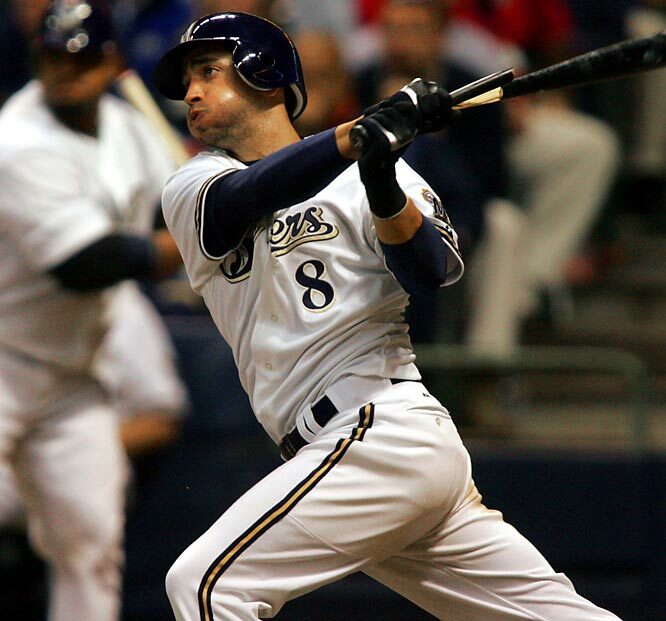 The cornerstone of the Milwaukee Brewers offense is 2011 MVP and perennial MVP candidate Ryan Braun, 2010 (.304 Avg, 25 HRs, 103 RBI) 2011 (.332 Avg, 33 HRs, 111 RBI) 2012 (.319 average, 41 home runs, 112 RBI). Ryan Braun continues to prove his critics wrong and will continue to produce at a Hall of Fame rate. With continued success like this Ryan Braun will be a deserving 1st ballot Hall of Famer. With Aramis Ramirez at 3rd and Corey Hart at 1st (most likely spot) the corner infield spots for the 2013 Milwaukee Brewers are solidified and constantly producing. Aramis Ramirez is as consistent as they come for a 3rd baseman: 2010 (.241 average, 25 HRs, 83 RBI) 2011 (.306 Avg, 26 HRs, 93 RBI) 2012 (.300 average, 27 home runs, 105 RBI). Please read the other great articles on MLB reports for more in-depth information on Aramis Ramirez. Corey Hart will be playing for a long-term contract in 2014 and it is a many a Brewer fans hope that he will re-sign in Milwaukee. Corey Hart has solid numbers over the last 3 seasons: 2010 (.283 Avg, 31 HRs, 102 RBI) 2011 (.285 Avg, 26 HRs, 63 RBI) 2012 (.270 Avg, 30 HRs, 83 RBI) but he remains a very streaky hitter. There is interest from both sides on a long-term extension but some are wondering if it makes sense. This 3 year trend for each player shows you that they have been prolific, so as long as they play to their capabilities all will be well. Hart will be sidelined for the first month of the year and the club is looking for answers to replace him. You can read an article we did on that very topic here. Shortstop will be a battle between Jean Segura and Jeff Bianchi. Segura has a definite leg up with being listed higher in the depth chart. Segura batted for a 3 Slash Line of .264/.321/.652 in 148 AB after coming over in the Zack Greinke deal. So far he is batting .364 in Spring Training. Ramirez has 778 Extra Base Hits by the age of 34 – including 80 last year (1st in the NL). It is not to hard to conceive that he could hit another 300 + XBH in his career and challenge for a top 25 spot in MLB history. At 3B, Aramis Ramirez will be entering his 16th season in the Major Leagues. We wrote a great piece about how is underrated here. Unfortunately, he does seem to battle the injury bug periodically. Taylor Green 3B/1B isn’t doing very much in Spring Training to stay with the big club either. The Canadian is hitting .158 so far. In 140 MLB AB – he has a 3 Slash Line of .207/.266./.609 with 3 HRs and 14 RBI. He will probably be sent down if his poor start persists. Jeff Bianchi is struggling in March and to make matters worse – he had to withdraw for Team Italy in the WBC for an injury. Bianchi played 3B/2B and SS last year. 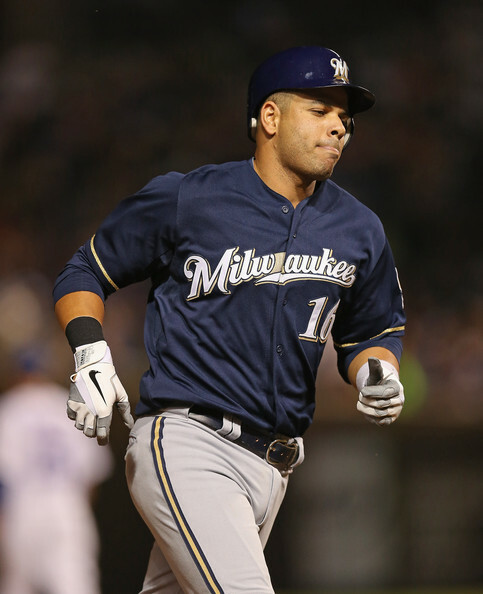 With Aramis Ramirez and Hart battling injuries, maybe he will stick as an extra INF when the team breaks camp. He may also have a chance to see some Pinch Hitting duties this season. In RF, Norichika Aoki will man the position to start off with. read about his great chance for a season here. In CF, Carlos Gomez is coming off of his best year in the MLB ( 3 Slash Line of .260/.305/.768 – with 19 HRs, 51 RBI and 37 SB (5th in the NL) in his 415 AB. He is now 27 Years Old. Gomez never walks, however he can be a good back of the lineup hitter, with 20/20 capability. His defensive is also adequate. The 2012 Southern League MVP Hunter Morris is waiting in the wings to take over at 1st base. There are a lot of unknowns with Hunter but he is a cheap internal option if Corey doesn’t get extended. Speaking of unknowns, Rickie Weeks will need to bounce-back from a terrible 2012 and become the Rickie Weeks of 2010 and 2011 for the Brewers to compete: 2010 (.269 Avg, 29 HRs, 83 RBI) 2011 (.269 average, 20 HRs 49 RBI), not amazing numbers in 2010 and 2011 but Rickie produced enough to be an integral part of the Brewers lineup. No offense is complete without the anchor behind the plate. Lucroy: 2012 (101 hits, 12 HRs, 58 RBI, .320 Avg in 96 games played) Martin Maldonado: 2012 (62 hits, 8 HRs, 30 RBI, .266 Avg, 78 games played). Maldonado’s numbers make him an excellent backup catcher, but Lucroy’s leadership, poise, and offensive firepower make him an All-Star caliber player. 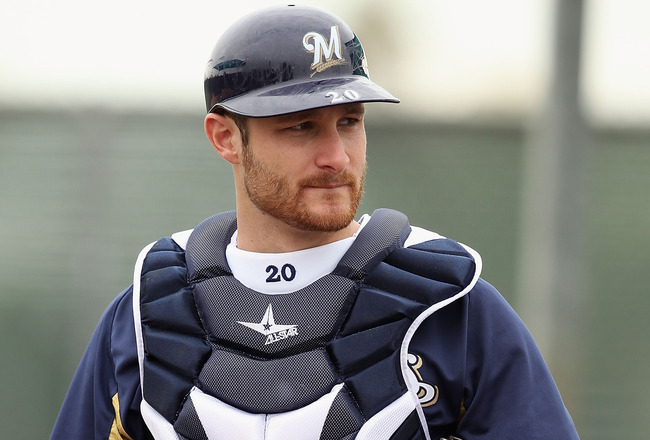 If the Brewers can keep Lucroy away from suitcases, trunks, garbage bags, backpacks, and anything else that can transport clothes they will have their 2013 All-Star Catcher behind the plate throughout the season. Taking into account all that went wrong for the Milwaukee Brewers last year: the key injuries and under-performing players, the Brewers finished 5 games out of the 2nd wild card. With the same potent lineup, an upgraded bullpen, and the signing of one or two veteran starting pitchers the Brewers should surprise many in 2013 and compete for the NL Central Crown. When the 2013 Milwaukee Brewers season comes to a close all the negative descriptions from last year will be replaced by: amazing, outstanding, exceptional, brilliant, and magical. With that said, Let’s Go Brewers! Jonathan Lucroy was hitting .345 with 5 HRs and 30 RBI in his 43 Games before breaking his hand is a weirdly described luggage accident. Lucroy can be a difference maker with his offense at the catchers position going forward. There is a Hyperlink below to download this Podcast. 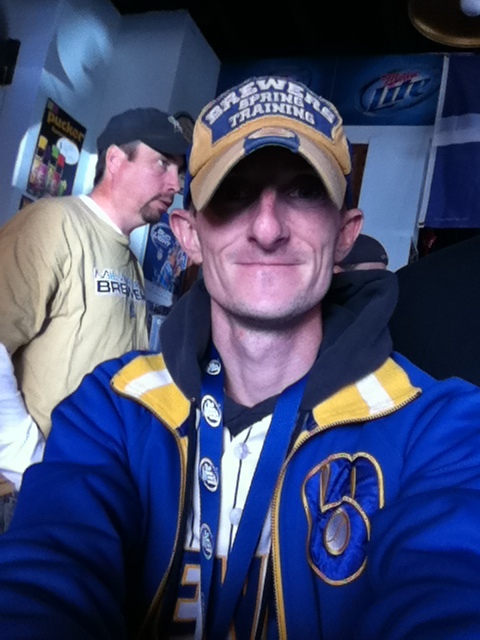 Posted on March 10, 2013, in The Rest: Everything Baseball and tagged @brewerpride06 on twitter, alex, aramis ramirez, Ariel Pena and Miguel De Los Santos, brandon kintzler, brewers depth chart 2013, burke badenhop, carlos gomez, chris narveson, corey hart, derrick turnbow, francisco rodriguez, hunter morris, jean segura, jeff bianchi, jim henderson, john axford, Johnny Hellweg, jonathan lucroy, jose veras, Josh Stinson, kameron loe, mark rogers, mike fiers, Mike Gonzalez, miller park, milwaukee, milwaukee brewers, Milwaukee Brewers 2013 Roster, national league, NL Central, Norichika Aoki, rickie weeks, ryan braun, Shawn Marcum, taylor green, tom gorezelanny, tyler thornburg, wbc, wily peralta, yovani gallardo, zack greinke. Bookmark the permalink. 3 Comments.